The Magician’s Wand is poised with great balance for the seasoned magician. This two-part screw together wand is hand crafted from the finest wood and brass materials. 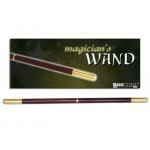 The wand stands 13.5 inches tall and weighs 5 oz. with a heavy feel.